Two emblems from MP Hall manuscript 14. Let us now look at the first of the four emblems in Manly Palmer Hall manuscript 14. We have already looked at two others in some detail. The text at the top states that experience is proof. Here again we have a familiar image of a wide necked flask with a castellated top. On the left is the conjoined Sun and Moon, while on the right is the image of the Sun alone. Above the top of the flask are set seven little flasks, arrayed along a line which at both end terminates in a flask. A bird is in the act of pouring a red liquid from two flasks it has upturned, into the wide neck of the main flask. Below the flask stand five philosophers. These are labelled, from the left, We dissolve, we putrefy, we sublime, we divide and we conjoin. A shield below show a red dragon. This may relate to the red dragon on the right side of the flask which is labelled "the dragon eating its own tail". The main action is set in the large flask. At the bottom of this is a layer of earth or soil with a spade. Onto this are falling the four limbs cut off from a human body together with what appears to be drops of blood, or perhaps some other red liquid. In the wide neck of the flask is a circular space within which we see female figure. She is labelled "the white wife of the lion". It may be that we are to understand that it is her dismembered limbs that fall down to the base of the flask. This circular space is being acted upon by the Sun-Moon on the left and the Sun on the right, both of which send rays down into it. The circular space is also surrounded by four figures, the lion below, the red dragon on the right, two birds at the top and a bird set in a circle of fire and smoke, possibly an image of a phoenix. On the back of the woman we see a bird lying on its back with another bird standing upon it. 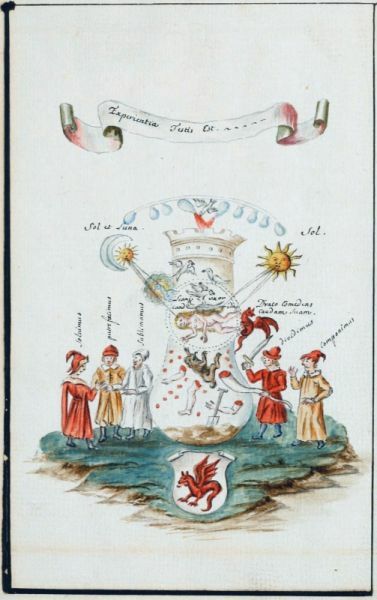 The flask and its contents obviously relate to the image we have explored in the discussion on an alchemical image in a German almanac as well as to the second emblem in MP Hall Ms 14. In this series the emblematic idea explored appears to be being presented through two images, so we are viewing a first and a second stage. 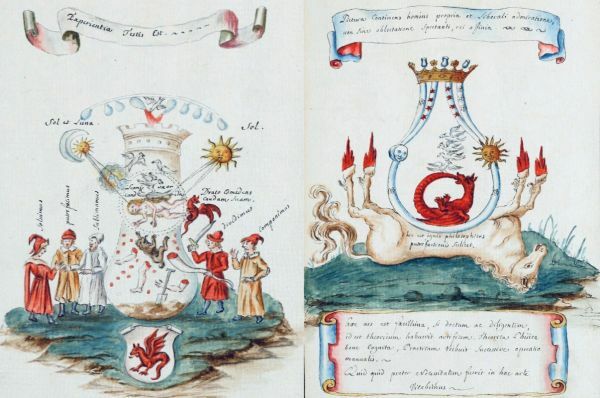 In the second image the sun and moon find their way into the walls of the flask, while the red dragon eating its tail now moves into the lower part of the flask, and the two birds outside the flask at the top now are seen as within the flask joining the two others.